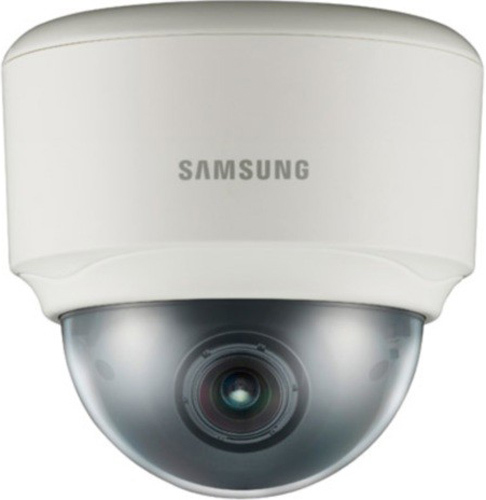 The Samsung SND-7080 High-Resolution 3 megapixel full HD WDR Dome Camera is encased in an Ivory plastic body that provides unparalleled durability, making it suitable for both indoor and outdoor applications. In addition,weatherproof housing ensures uninterrupted surveillance in high-risk locations as well as in harsh weather conditions. Automatic gain control adjusts the signal strength to maintain a constant brightness level,Day/Night functionality with an automatic IR filter operation, the camera switches between color and B&W as per changes in the ambient lighting, ensuring accurate color reproduction in daylight and enhanced B&W images at night. With SSDR (Samsung Super Dynamic Range) to enhance color reproduction and resolution and reduce signal noise, Face Detection and Audio Detection - alerting the system to events beyond the camera's field of view, ROI(Region of Interest). Its 3 to 8.5mm varifocal lens lets you adjust the aperture to change the camera view, so that you can get clear quality images or a wider coverage. With the WDR feature, this Camera can properly exposes scenes containing a mix of bright and dark regions, thus enabling you to identify details of objects in a high-contrast environment.It also features digital noise reduction along with face detection function detects the position of the human face and the information is sent by video stream. The Samsung SND-7080 has many exciting features for users of all types. The Samsung SND-7080 is sold as a Brand New Unopened Item.